The reason that Charles Dickens’s books are so long is because he was paid by the word. 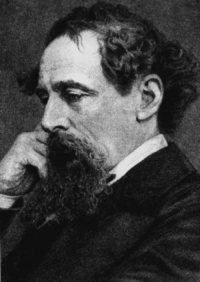 Contrary to popular belief, Dickens was not paid by the word for his books. He was, rather, paid per installment. All but five of Dickens’ novels were originally published in twenty 32-page installments in nineteen issues (the last a double installment) that sold for one shilling each, though some, i.e. Oliver Twist, were issued in ten installments. More to the point, at one shilling each, the installments were so inexpensive that just about anyone could afford them: At the time, books cost an average of thirty-one shillings, six pence (£1, 11s, 6p), a lot of money for the average British citizen of the era. The average weekly wage then was one pound; a standard book cost over a week’s salary. Thus Dickens reached a much broader audience than if the novels had been originally issued in book form. Sketches By Boz and Oliver Twist, originally serialized in the weekly magazine, Bentley’s Miscellany, were later issued in separate book form yet were subsequently issued in monthly parts: Once again, the cost of books was prohibitive for many of Dickens’s readers and by reissuing the books in parts the publishers hoped to increase their financial return through volume sales of installments. While I have yet to discover how much Dickens was paid later in his career, in 1836 he earned £20 for each monthly episode of The Pickwick Papers, an extremely handsome salary. Yet it was not enough. For most of his career Dickens also edited and wrote for magazines. He was part owner of Household Words, which he also edited. For this, he received an annual salary of £500; with income from his contributions to the magazine his annual income was £1,163-£1,652, well over $350,000 in today’s money. And so Dickens wrote A Christmas Carol, and at warp speed, completing it in six weeks on top of all the other writing and editing he was simultaneously engaged with. Originally issued on December 17, 1843, it sold 6,000 copies within five days. 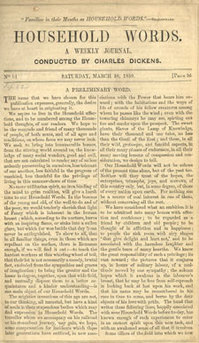 Another 2,000 copies were printed and sold out by January 6, 1844. It was a smash success. But a financial disaster. 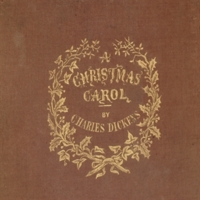 Priced at five shillings to stimulate holiday gift sales, the elaborate production that Dickens, with contractual rights, insisted upon - John Leech was commissioned to produce eight illustrations, four to be hand-colored steel engravings, the others as woodcuts; expensive green end- papers were used, and then replaced with others of similar quality but yellow; the titlepage, originally printed in blue and red was re-printed in green and red; all edges gilt - was such that the book was unable to earn a profit. 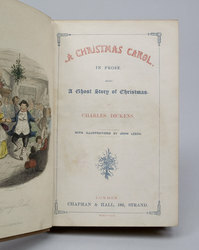 Dickens blamed Chapman and Hall and broke with them. Most of the thirty-two page installments were forty-nine lines to the page; total words for each installment approx. 18,800 words; times twenty installments equals 376,320 total words per book. At £20 per installment, Dickens earned £400 per book. Many believe that Dickens earned a penny a word. It was less than that. He earned a farthing per word. A farthing is a quarter of a British penny. But a farthing went a lot farther in those days. That £400 in 1836 equals approximately $238,000 in today’s money. And, remember, that was for his first novel, Pickwick Papers. Nowadays, a first-time novelist needs a super-agent to get a deal like that. Hatton & Cleaver. Bibliography of the Periodical Works of Charles Dickens. Smith, Walter. Charles Dickens in the Original Cloth. Allingham, Philip. A Review of Unequal Partners: Charles Dickens, Wilkie Collins & Victorian Authorship. University of Glasgow, Book of the Month, December 1999. Charles Dickens: A Christmas Carol. Richard Ellmann, Oscar Wilde. (1988). A tip o’ the hat to David Brass for providing images, and for explaining the mysteries of the British monetary system to me; I couldn’t fathom farthings. The reason that Charles Dickens's books are so long is because he was paid by the word. All but five of Dickens' novels were originally published in twenty 32-page installments in nineteen issues (the last a double installment) that sold for one shilling each, though some, i.e. Oliver Twist, were issued in ten installments. More to the point, at one shilling each, the installments were so inexpensive that just about anyone could afford them: At the time, books cost an average of thirty-one shillings, six pence (£1, 11s, 6p), a lot of money for the average British citizen of the era. The average weekly wage then was one pound; a standard book cost over a week's salary. Thus Dickens reached a much broader audience than if the novels had been originally issued in book form. 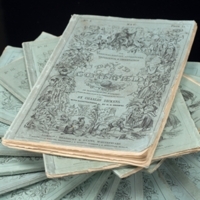 Sketches By Boz and Oliver Twist, originally serialized in the weekly magazine, Bentley's Miscellany, were later issued in separate book form yet were subsequently issued in monthly parts: Once again, the cost of books was prohibitive for many of Dickens's readers and by reissuing the books in parts the publishers hoped to increase their financial return through volume sales of installments. Yet it was not enough. For most of his career Dickens also edited and wrote for magazines. He was part owner of Household Words, which he also edited. For this, he received an annual salary of £500; with income from his contributions to the magazine his annual income was £1,163-£1,652, well over $350,000 in today's money. Most of the thirty-two page installments were forty-nine lines to the page; total words for each installment approx. 18,800 words; times twenty installments equals 376,320 total words per book. At £20 per installment, Dickens earned £400 per book. Many believe that Dickens earned a penny a word. It was less than that. He earned a farthing per word. A farthing is a quarter of a British penny. But a farthing went a lot farther in those days. That £400 in 1836 equals approximately $238,000 in today's money. The pay scale for writers has declined dramatically over the last 170 years. A farthing is beginning to look pretty good to me: "Please Sir, may I have some more?" A tip o' the hat to David Brass for providing images, and for explaining the mysteries of the British monetary system to me; I couldn't fathom farthings.